Since a picture of Pope Francis and Grand Imam Sheikh Ahmed Al Tayeb appearing to lock lips together was posted online, the controversy it generated has soared. Many observers on seeing a picture of the event published by Reuters, believed the moment was just a tad too intimate, with many suggesting the two religious leaders should get a room. Some social media users also used the picture to mock both religions' stance on homosexuality, as well as the UAE’s aversion to public displays of affection. "This is some next level holy gayness... I wonder what Quran and bible thinks about this," someone posted on Twitter. "So the Pope can kiss men, but the rest of us can't?" another joined. 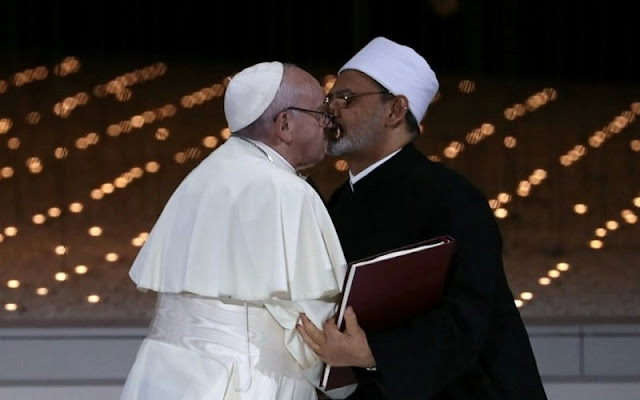 Other pictures of the event has since been released and they appeared to show that the Pope and Imam did not actually share a full-blown kiss but more like a peck.